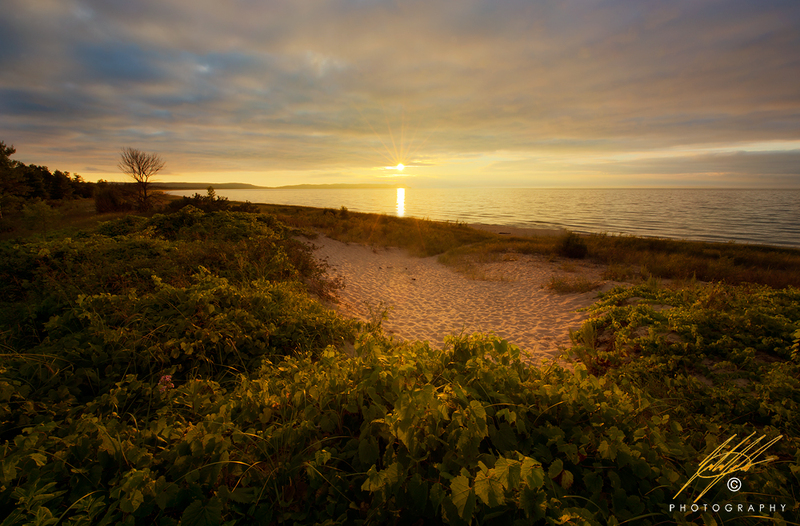 Good Harbor beach is a beautiful historic location in the Sleeping Bear Dunes. The location was used to ship out wood from logging on shore. This started around 1863. A small village was actually build near this site in the mid 1870's. The only evidence of any of this activity is the remaining artifacts from a large dock build at Good Harbor beach. Many of the dock pilings can be seen when the water levels are low and when waves are crashing towards shore. For many, this location probably looked to hold grand prospects and a bright future. Many of the original people involved with business in the Good Harbor area quickly sold their businesses and bought up property. I can only assume why. One look down the shoreline makes it apparent how special the landscape truly is. In "The Good Harbor" I aim to depict the concept of 'a bright future' I can say for one that this and other locations in Northern Michigan have positively affected the way that I look at the world. I also avoided talking the photograph from the waters edge, as most do. I felt as though I needed to take a step back to observe the entire area. I hope that this new view of Good Harbor beach brings warmth and a feeling of grandeur that is often missed when viewing the wonders of Northern Michigan. Please enjoy, comments and critique is always welcome. Canon 6D, Nikon 14-24 (@14mm), ISO 100, F.22, 1/25th, 1/10, and 1/2 shutter speeds were used and hand blended to capture the dynamic range of the scene.